The Bull Terrier was developed from dogs that were used for animal baiting and pit contests, although it has always been kept as a companion. 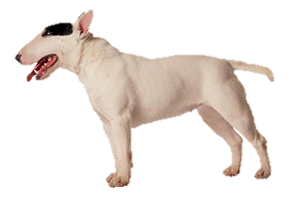 The breed was previously known as the Bull and Terrier, Bull-dog Terrier, White Cavalier, or Hink's Breed, after their creator. The Bull Terrier was developed shortly after the ban on cruel sports that was imposed in England in 1835. Since the popular bull-baiting had been outlawed men turned their Bulldogs on each other, but the dogs proved to be too slow for this new ‘sport’ and not very entertaining. It was believed a better fighting dog could be obtained by crossing them with terriers (most commonly the extinct Black and Tan) and the resulting dog was ugly, savage, and indeed, an excellent pit fighter. In the 1850s James Hinks of Birmingham sought a dog that was a ‘gentlemen’s companion’ instead of one for these sports. He improved these dogs by crossing them first with the extinct English White Terrier and several other breeds. It is thought that the Dalmatian, Greyhound, Spanish Pointer, Foxhound, Whippet, Borzoi, and Collie were all used at some point in the bloodline. He desired an all white animal, but certain medical problems became associated with his dogs (in particular deafness) and so later breeders began adding color through the Staffordshire Bull Terrier.